Szapy: How did you get the chance to play at Neckbreaker's Ball Tour? Or in other case, you had a plan for a tour in autumn/winter? Päde: Well no we didn't plan anything, we just got a request to this tour and we said, hell let's do that. I mean I like Dark Tranquility and never saw them live but now I will. Szapy: How you spend the time (apart from sleep) while you spend many hours on the road? Szapy: You have concerts all over the world, visit many places. Could you tell me, which was the most weird (country/)experience you had on tour? Szapy: You could play in hungarian club(s) and festival(s) too. What's your opinion about the places, which was the favourite/better place? I would say that Rockmaraton was the best concert I had in Hungary. 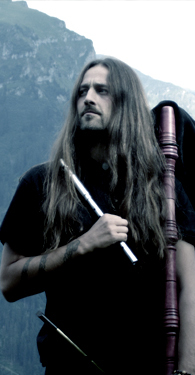 Szapy: You're also recording the new album, Helvetios. I already checked your blog, it seems, that you're very close to finish it. What can we expect, can you tell me something about it? extend the focus on it, so I'm looking forward to it, hope you do so. 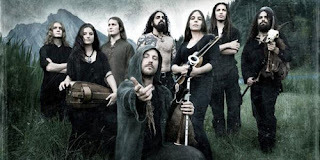 A lot of folk tunes are bloody fast and very hard to play... it's probably the biggest challenge in playing music for me so far..
Szapy: During the recordings, would you tell me, which was the hardest part? Szapy: Your music is more complicated than metal as usual. As you have more&special instruments (for 8 person together is not an easy choice), it seems to me, that's much harder to play together, or create song, that sounds well. How much time you spend with practicing? Or is it the best way to have more concerts, and play live, from the heart? Szapy: In studios, there's always fun too, if the team is good. What do you think about it? Do you also enjoy that type of recording, or better to do it separately, where everyone is only concentrating on his/her part? Päde: We normally record separately so everyone can concentrate on his stuff. I would love to work more in a team but thats also a question of money, because i suppose it would take more time in the studio. Szapy: Will you release any single or video before the new album, or maybe somewhen after the release? Szapy: We could see, that you're also glad that the video of Inis Mona is over 10million views, and now thousandfols has also millions of clicks youtube. How much more could you imagine? Päde: Hmm, actually Inis Mona is indeed over 10 million clicks, Thousandfold has less then 4 millions. Interestingwise Omnos has almost 10 millions too, which is a big surprise for us. Hard to imagine a number related to youtube - it's more a case of luck and on the internet the factor of accident is quite big. 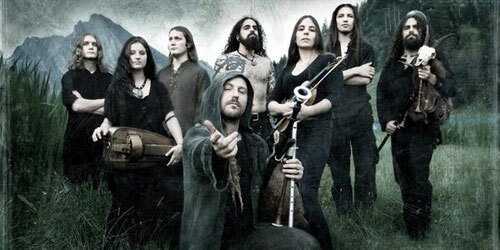 Szapy: You're going to finish this year in Zurich, with the Festival "Eluveitie & Friends". Could you tell me about this idea & program? How this idea came, and what was the concept of inviting other bands? success we'll probably do it again next year. Szapy: What' coming in 2012? And what's your message to the fans (also Hungary and worldwide), your wishes for next year? 2012 we'll be mostly on tour somerwhere. I suppose it will be most intensive year the band history.